Continued from my last post, today I am featuring 2 more pieces from Lysse. Leggings are a versatile piece that every woman should own. They can be dressed up or down for daytime or evening. For an evening look, I paired these sequin leggings with a tunic that is long enough to cover my bottom. I then finished off the look with a leather jacket to achieve that rocker chic look. If you're more on the unadventurous side like I am, these leggings are the perfect solution. They're fun yet understated. This look is perfect for a night on the town. Nothing beats a pair of leggings on the weekend. I pretty much live in these leggings for the past few weekends. They are thick yet insanely comfortable to wear. I adore the ribbed texture as well. It's such a refreshing change from the traditional leggings. Gray is a neutral that can go with almost everything. A good pair of leggings is always welcome in my closet. Both leggings have waist measurement = 12" and 36" in length. If you're looking to add some leggings to your existing work and leisure wardrobe, I recommend you check out their site. With a vast selection, there is certainly something for everyone. Those leggings are so versatile! 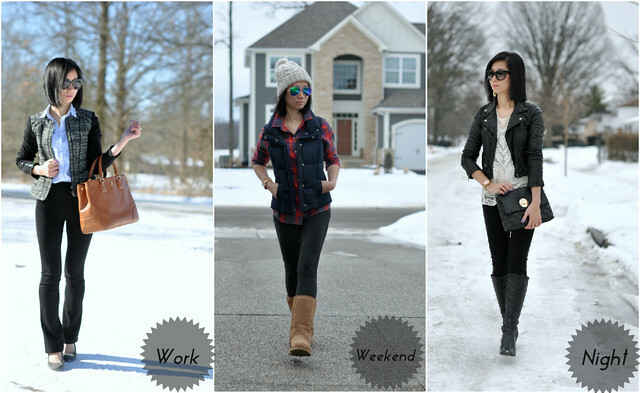 Love all three looks! I like the rocker look with the lace and moto jacket! Especially in love with the night look...that leather jacket is amazing! 3 great looks on you. wow, these leggings look amazing on you! i'm also loving your cat-eye sunglasses and will need to check those out myself. stay warm Sydney! I love the leather and lace - what a stunning combo! These leggings are clearly awesome. I love all of these outfits! Seriously in LOVE with that lace top! And that moto jacket is just perfect with it! Thanks for sharing this with Manic Monday! The fashion trend has changed a lot. I loved your dressing style, you made a casual legging a lot very attractive. I have also shopped for carbon 38 workout clothes, these are very comfortable. I wear them to gym, to office sometimes and casually as well.